Helifish is based in Darwin and specialises in Heli-fishing adventures tailored to suit your imagination. We operate 2 R44 helicopters capable of carrying up to 6 passengers and can cater for larger groups if required. 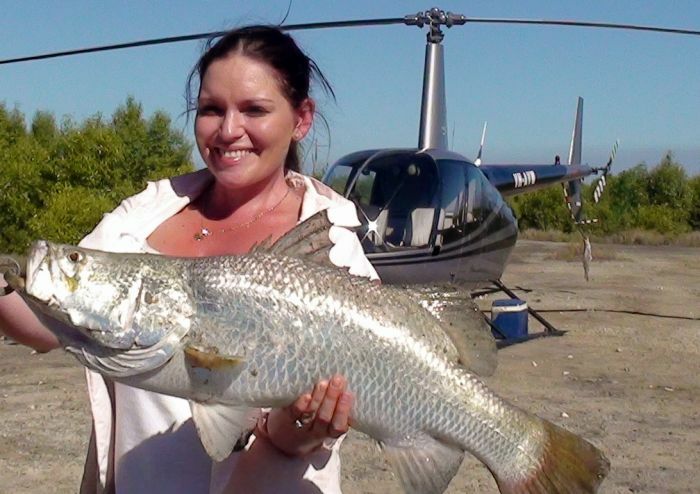 Not only do we give you the opportunity to catch the famous Barramundi, you will experience the exciting sensation of flying in a helicopter to your remote destination. The Northern Territory and Darwin region’s brilliant landscapes and wildlife are only minutes away from your departure point and there is no better way to see it than from a helicopter. Helifish offers a variety of Helifishing trips and tours to cater for all budgets, available time and personal preferences. The following are tailored to suit different tastes and preferences and all trips can be altered to suit your needs. This is the Best full day Helifishing tour on offer and one of our most popular. If its quality Barra your’e after and amazing scenery and wildlife to experience then this is it. The full day trip is where we usually get the big ones!! The cost based on a minimum of 2 persons is $1250.00 per person and $990.00 per person for a group of 3. Weight restrictions of 270 kgs combined apply for 3 persons. Our ¾ day trip is a great Helifishing experience. We depart around 8.30 am and usually return mid afternoon but may alter departure and return times to target the tides if it suits you. 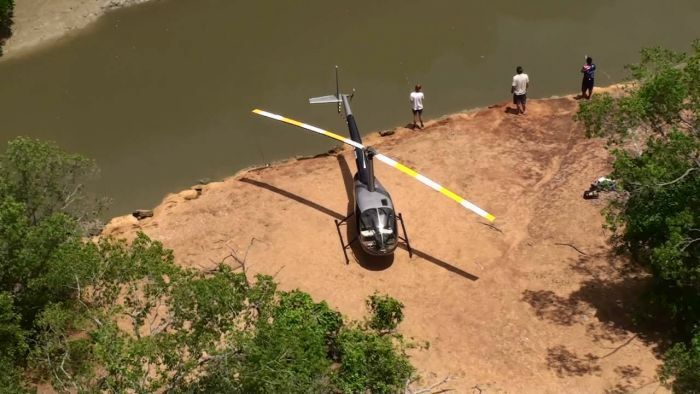 You will get around an hour and a half flying in the helicopter to and from our remote heli fishing spots over spectacular flood plains, rivers and billabongs. We will fish a variety of different locations depending on tides and time of day, giving you at least 5 hours with lines in the water. The target fish species are Barramundi, Mangrove Jack, Salmon and Cod with others often caught. 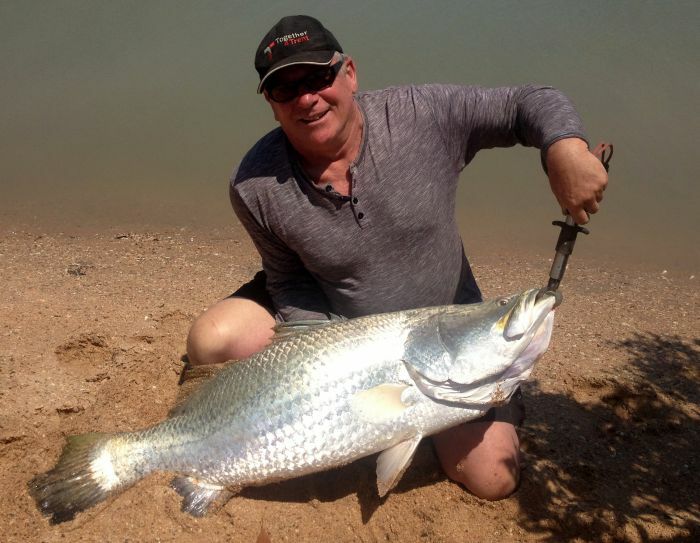 We fish in billabongs, creeks and estuaries near the ocean on clear banks offering good access and crocodile safety. We supply all fishing gear , lunch, softdrinks and plenty of cool water. You will need to bring a hat, sunscreen, sunglasses and a camera. Light cool sun protective clothing is recommended. Your Helifishing trip departs from MKT airfield at Noonamah which is about a 30 mins drive from Darwin City. The cost based on a minimum of 2 persons is $1050.00 per person and $880.00 per person for a group of 3. Weight restrictions of 270 kgs combined apply for 3 persons. Our 1/2 day trip is an affordable, exciting Helifishing experience that you will really enjoy. Departure time can be arranged to suit your schedule or we can target optimum tide times. You will get about an hour flying in the helicopter to and from our remote Heli fishing spots flying out along isolated coastline, rivers and billabongs. We will fish up to 3 different locations depending on tides and time of day, giving you at least 3 hours fishing time. The target fish species are Barramundi, Mangrove Jack, Salmon and Cod with others often caught. We fish in, creeks and estuaries near the coast on clear banks offering good access and crocodile safety. We supply all your fishing gear, softdrinks and plenty of cool water. You will need to bring a hat, sunscreen, sunglasses and a camera. Your Helifishing trip departs from MKT airfield at Noonamah which is about a 30 mins drive from Darwin City. The cost based on a minimum of 2 persons is $850.00 per person and $690.00 per person for a group of 3. Weight restrictions of 270 kgs combined apply for 3 persons. For an Adventurous day of Reef fishing we can take you by Helicopter to Clearwater Island Lodge for a full day of Fishing. Surrounded by pristine beauty, your fishing adventure will include experiencing spectacular clear water, coral reefs, pristine white beaches and rock-bars. You’ll likely catch one or more of the much sought-after tropical species such as Barramundi, Threadfin Salmon, Blue Salmon, Golden Trevally, Queenfish, Golden Snapper, Mangrove Jack, Black Jewfish and many others. Price includes Return Helicopter flight, Fully guided boat and fishing gear, lunches and refreshments. We depart Darwin at sunrise and return at sunset giving you up to 9 hours on the water fishing. The cost based on a minimum of 2 persons is $1550.00 per person and $1200.00 per person for a group of 3. Weight restrictions apply for 3 persons so please contact us for details. For the Ultimate Heli-fishing experience you can’t beat a multi day Fishing Adventure. We will tailor a trip of a lifetime with options to fish all over the Northern Territory as well as seeing ever changing landscapes. You can fish the Daly river, Victoria River, Mary River, Bullo River or nearly any piece of water in the NT. We can organise to tie in boat fishing trips with operators in the NT and can accommodate you in swag or 5 star. Helifishing is simply accessing remote fishing spots in a helicopter and in doing so being able to see and do things that no other form of transport can offer. Firstly a flight in a helicopter for most people is one of the most amazing experiences that flying has to offer. The ability to fly slowly, hover, ascend and descend vertically are only some of the flight characteristics helicopter flight offers. A helicopter gives you the ability to access many places that cannot be easily accessed any other way. So for fishing this gives you the ability to get to isolated and often untouched locations where the fishing can be totally brilliant and the areas are usually spectacular. Helifishing is more than just fishing. 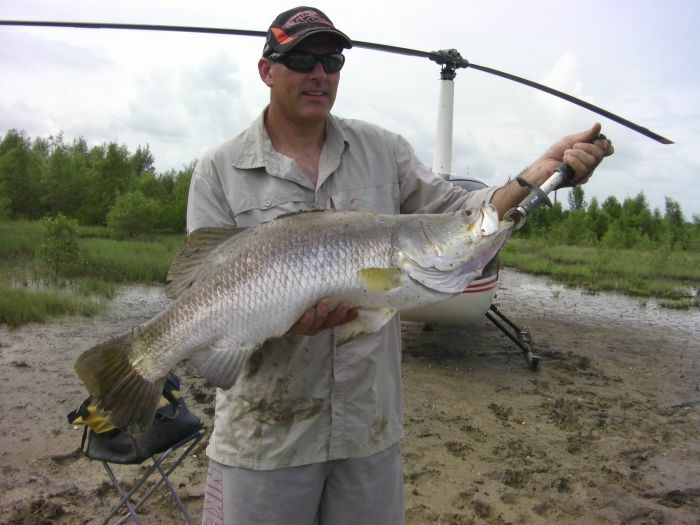 The flight to your fishing spots will take you over some very spectacular and isolated country including vast floodplains, rivers, wetlands and billabongs. Flying in the top end of the NT offers scenery that rates up there as good as any in the country. Due to the unparralled visibility of our R 44 helicopter your visual experience and photo opportunities are second to none particularly with the doors removed. Helifishing is suitable for all ages and children of all ages are very welcome as long as they are accompanied by an adult and supervised. Join Captain Imagine for a great day’s fishing for up to 7 guests. Our boats are set up with your comfort, safety, and fishing success in mind. Equipped with all the safety & emergency gear and the essential electronics, i.e. radar, fish finder,and GPS plotter. This is as real as it gets. Wind in your face. Sunrise over the horizon, you can enjoy the scenery and wildlife along Timor Leste’s spectacular coastline as you enter the easy waves of the Timor Leste Harbour. It just doesn’t get any better! Come & experience the adventure of a lifetime with Fishing Timor Leste: Imagine Fishing Charters & Boat Hire!! The fresh, floral air energizes you. The warm, tranquil waters refresh you. The breathtaking, natural beauty renews you. Look around. There’s no place on earth like Timor Leste. Whether you’re a new visitor or returning, our unique islands offer distinct experiences that will entice any traveller. We warmly invite you to explore our islands and discover your ideal travel experience. Our fishing and game charters cruise to some of the best fishing sites from Liquica, to Manatutu, and from Dili to Atauro. Our fishing vessels are equipped with all the essential electronics such as fish finder, depth sounder and GPS. We will also provide all of your bait, rods & reels, and game fishing lures that you may need to catch Giant Trevally, Tuna, Snapper, Spanish Mackeral, Mahi-Mahi and other Pelagic species of game fish. Snorkeling is fun, safe, and easy aboard the The Imagine. Join us for a half day or full day underwater tour to the shallow, inner coral reefs located around the islands of Timor Leste and Atauro. See the colourful gardens of coral amongst the crystal clear waters and beauty of the Timor Leste landscape. Imagine charters offers private cruises for clients from all over the world that explores the magnificent coast of Timor Leste. Our Islands’ perfect weather coupled with an unsurpassed beauty and allure lets you experience Timor Leste from a different angle. You will see incredible marine life year round, cruise alongside Dolphins and witness the splendour of the migrating whales. Escape to the beautiful Island of Atauro aboard The Imagine. With private and secure overnight accommodation, this package allows you to enjoy incredible snorkeling/diving, fishing and hiking. Experience the scenery or just the cruising of the blue water of the tropical island. Your guide Eddie Riddle has been fishing North Queensland waters since 1985 and has unrivalled knowledge of these diverse fishing grounds. His experience extends to all facets of fishing media and knows what clients want – not only lots of fish, but a good time on the water. Eddie currently uses a 5.6m custom built (full survey) Seajay sportfishing vessel which is equally at home in shallow waters chasing barramundi or skipping baits and lures for Townsville’s famous run of black marlin. You name… and if it’s at all to do with fishing in North Queensland waters, Townsville Sportfishing Charters can do it – and do it well. Fishing charters with Ron Osman of Hawkesbury Fishing Charters. Fishing for BIG Jewfish, Kingfish, Bream, Flathead and more. Various pickup spots for easy boarding for passengers coming from Sydney or the Central Coast. Fish Broken Bay, Brisbane Waters, Pittwater and the famous Hawkesbury River. Hawkesbury Fishing Charters has been helping their customers make the most of their days fishing since 2006. Ron Osman is an experienced fishing charter guide within the local waterways of the Hawkesbury River, Pittwater, Broken Bay and Brisbane Waters on the Central Coast. Visit our website to see what others have to say about their great day out on the water hauling in the fish with Hawkesbury Fishing Charters!